Dive deep into a sea of pleasure and sun-kissed fantasies with the naughty California Dreaming™ Venice Vixen. The luxurious massager has 10 intense vibration functions, 3 independent shaft vibrations and a unique teaser with a sensual clitoral encaser for one-of-a-kind pleasure experience. 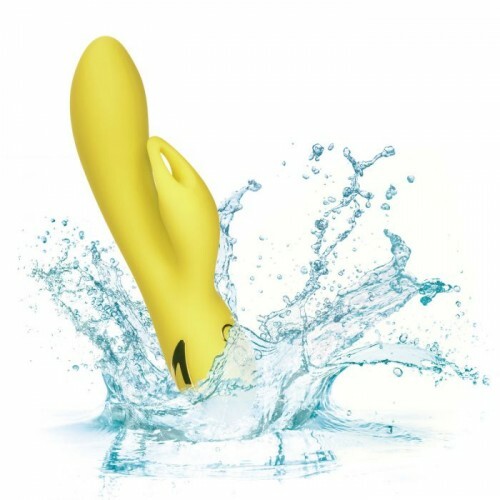 The seamless silicone body and flickering teaser put out knee-shaking stimulation in and out of the water. Whether you’re looking to turn up the heat with a lover or just enjoy some sensual solo time, this ravishing rabbit is ready. While contoured clitoral encaser moves with your body, the 3 independent shaft vibrations deliver intense internal stimulation. Control and customize your pleasure play with the independently controlled shaft and teaser vibration massager functions. Recharge the vibrating massager in 2.5 hours with the provided USB charging cable to enjoy 45 minutes of high-speed stimulation or 2.5 hours of low speed vibrations. Enjoy frustration-free control with the easy-touch 3-button control pad and security lock feature for travel-ready teasing. The virtually seamless body and self-sealing charging port allow you to get this versatile waterproof vibrating massager for a dip. The hypoallergenic premium silicone is body safe, unscented and phthalate free to keep you most sensitive spots, happy and healthy.